Summer in the South means a lot of things: heat, baseball, barbecues, and pool days. But it also means one very annoying thing: mosquitoes. Yes, it’s mosquito season again. Have you ever felt like it’s actually impossible to get rid of mosquitoes? We’ve all been there – when we feel like the days of mosquito bites and buzzing in our ears will never come to an end. But we’ve got 4 easy ways to get rid of mosquitoes, and we’re sharing them with you… Because we care about your health and your sanity this summer. 1. Attack their source. The most important thing to know about mosquitoes is that they love standing water. So the first step to getting rid of mosquitoes is to eliminate stagnant water from your yard. Inspect the entire exterior of your home – from gutters to flower pots – and eliminate all the standing water you see. Make sure nothing is left outside that can collect water, such as your kids’ toys, trash can lids, pet bowls, bird baths, fountains, kiddie pools, buckets, the list goes on! Check areas of your yard as well. If you notice puddles building up in your lawn or on a sidewalk or patio, fill in these spots so they’re level with the rest of the foundation in order to prevent future puddles. 2. Cover up. Even if you eliminate a mosquito’s favorite breeding grounds, that doesn’t mean you won’t encounter them this summer. Cover up to keep from getting bitten! Especially on hikes, make sure you’re wearing long sleeves, long pants, and closed-toe shoes. We know what you’re thinking… it’s too hot in the South to wear pants in the summer! Yes, that’s typically true. But that’s what light, breathable hiking clothes are for! Believe us, the small investment now can save you a lot of itching later! Use a DEET spray that can add an extra layer of protection to yourself and your family members. In the South, you may want to find one that is sweat-proof since you’ll likely find yourself sweating in the heat. And be sure to reapply after swimming! Check out this guide for some help finding the right spray for yourself. 3. Use fans and light bulbs. Protect your deck, patio, pool area, front porch, or wherever the party happens at your home in order to help keep mosquitoes from crashing the party. Mosquitoes aren’t the strongest fliers, so fans can make it difficult for them to get close enough to you to bite. And as an added bonus, it’ll help keep you cool outside! Yellow light bulbs can help tremendously. Since mosquitoes are attracted to lights, it can often be tough to avoid them once the sun goes down. 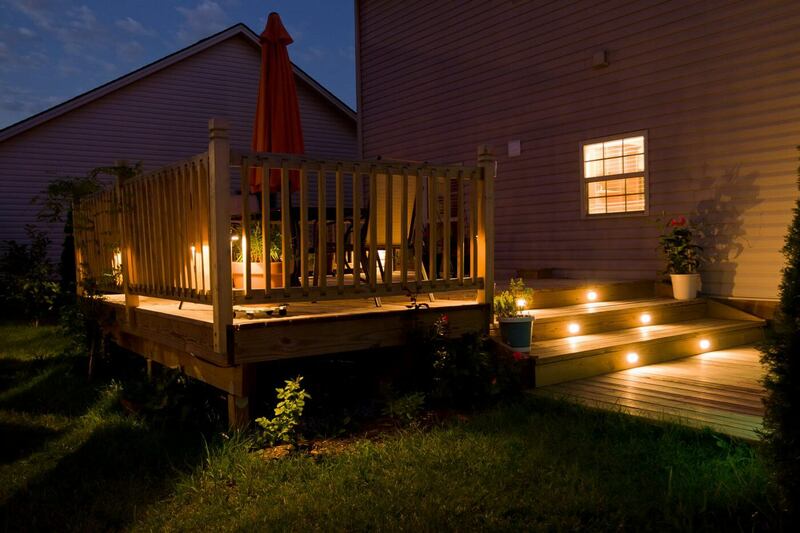 Using yellow “bug lights” are tougher for bugs to see, making it easier for you to enjoy your summer nights. 4. Schedule a treatment. This one requires the least amount of work on your part! Just call a pest control company (wink, wink – 706-979-2536) to schedule a treatment to keep your yard free of mosquitoes! We have plenty of plans available, and we’d love to come inspect your home and yard to recommend the best treatment for you. Oh, and did we mention that inspection is FREE? We’ve been seeing a lot of rain lately, so now is the perfect time to get in on this treatment. It takes less than 2 weeks after rain for mosquitoes to repopulate, so it’s important to act quickly! We also offer a one-time mosquito treatment if you’d like to protect your home before a big party (4th of July, anyone?). We’ll come out a few days before your event to help ward them off. Don’t wait to get rid of mosquitoes! Contact us today to take care of your yard.